As reported by Jane-Ellen Robinet, Dr. Brubaker joined the University of Pittsburgh in 1991 when the SHRS was Pitt’s newest and smallest school. During his tenure, the school’s enrollment has grown from 300 to 1,467 students, and its externally funded research has surged from $200,000 to more than $23.3 million. Dr. Brubaker, through his early establishment of the Center for Assistive Technology and a rehabilitation-engineering research program as well as other initiatives, succeeded in making Pitt a forerunner in the nascent field of rehabilitation science. “Throughout his long tenure, Dean Brubaker has dedicated himself to the attainment of excellence in every aspect of SHRS’s development. He has guided the constant growth of SHRS’s academic and research programs, both in number and quality, with remarkable managerial skill and vision. The more than 100-fold growth in research productivity during Dr. Brubaker’s tenure is almost beyond belief,” said Arthur S. Levine, MD, Pitt’s senior vice chancellor for the health sciences and John and Gertrude Petersen Dean of Medicine. Dr. Levine has named as interim dean Anthony Delitto, PhD, professor and chair, Department of Physical Therapy, associate dean for research in the SHRS, and affiliated faculty member of the McGowan Institute. Over the last few years, surgeons and scientists have developed a series of cartilage repair procedures that help to postpone the need for joint replacement. Bioengineering techniques are being developed to generate new cartilage, using a cellular “scaffolding” material and cultured cells to grow artificial cartilage. Through the month of June you will receive 30% off your Safranin O Staining, when you mention this ad. 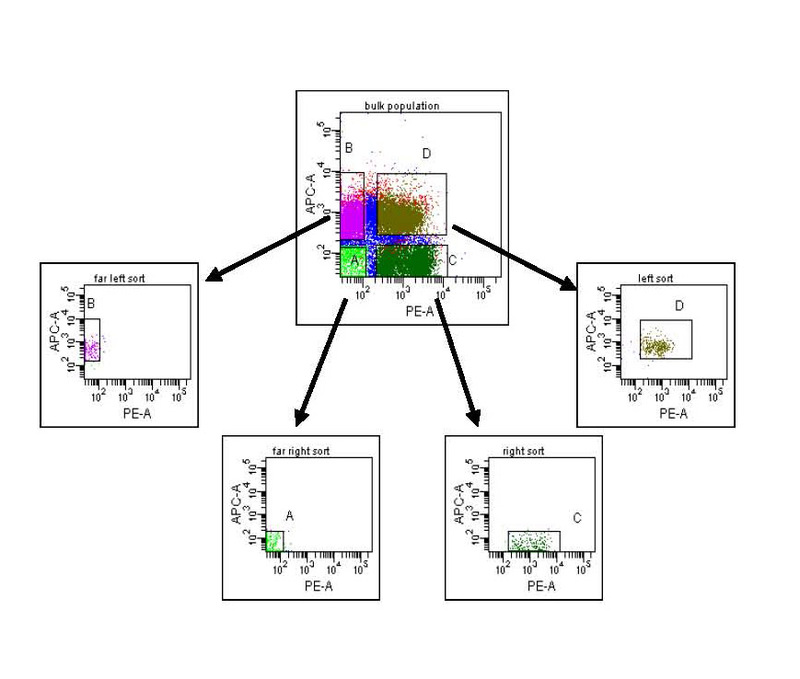 Whether you need a simple 1 or 2-color sort or complex multicolor single cell analysis and/or purification, we can help. Contact us for a free consultation of all your flow needs. Email Lynda for more information. The 5th Annual Conference on Vision Restoration: Regenerative Medicine in Ophthalmology will be held on June 25 – 26, 2015 in Pittsburgh, PA. This conference brings together 150+ multidisciplinary experts including scientists, clinicians, engineers, and others working in the fields of Ophthalmology and Regenerative Medicine. Attendees will be able to share ideas, insights and discoveries that will improve the outcomes for the vision impaired. For more information, please contact Lauren Wally at (412) 864-3283 or wallyl@upmc.edu. The annual Regenerative Rehabilitation Symposia series is a unique opportunity for students, researchers, and clinicians working in the interrelated fields of regenerative medicine and rehabilitation to meet, exchange ideas, and generate new collaborations and clinical research questions. 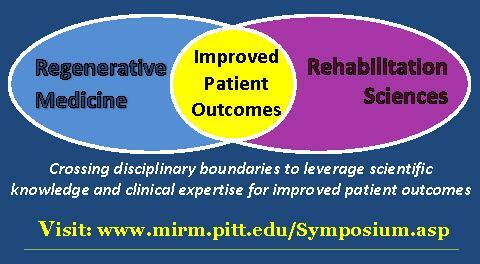 Jointly organized by the University of Pittsburgh Rehabilitation Institute, the School of Health and Rehabilitation Sciences at the University of Pittsburgh, the McGowan Institute for Regenerative Medicine and the Rehabilitation Research and Development Center of Excellence at the Veterans Affairs Palo Alto Health Care System, the Fourth Annual Symposium on Regenerative Rehabilitation will be held on September 24-26, 2015 in Rochester, MN, hosted by the Mayo Clinic. For more information on this event, please contact Katy Wharton at: rehabmtg@pitt.edu or whartonkm@upmc.edu or call 412-624-5293. McGowan Institute for Regenerative Medicine faculty mentors for this competition included Eric Beckman, PhD, and Charles Sfeir, DDS, PhD. As the technology developed moves forward, Drs. Cui and Little will also serve as mentors to the students. The Randall Family Big Idea Competition is made possible through the generous support of the Randall family. Robert P. Randall was president and chief executive officer of the Three Rivers Aluminum Company (TRACO), a prominent regional door and window company, which was acquired by Alcoa and is now a division of Kawneer. Mr. Randall continues to give back to the community through his position on the Board of Trustees at the University of Pittsburgh, his work with the United States Chamber of Commerce, and as a board member of both the Allegheny Conference on Community Development and the Pittsburgh Regional Alliance. Illustration: Oxi-DENT team. –Pitt’s Innovation Institute. For decades, robots have advanced the efficiency of human activity. Typically, however, robots are formed from bulky, stiff materials and require connections to external power sources; these features limit their dexterity and mobility. But what if a new material would allow for development of a “soft robot” that could reconfigure its own shape and move using its own internally generated power? By developing a new computational model, McGowan Institute for Regenerative Medicine affiliated faculty member Anna Balazs, PhD, the Swanson School’s Distinguished Professor of Chemical and Petroleum Engineering and the Robert v. d. Luft Professor, and Olga Kuksenok, PhD , Research Associate Professor, University of Pittsburgh’s Swanson School of Engineering, have designed a synthetic polymer gel that can utilize internally generated chemical energy to undergo shape-shifting and self-sustained propulsion. Their research, “Designing Dual-functionalized Gels for Self-reconfiguration and Autonomous Motion,” was published recently in the journal Scientific Reports, published by Nature. As a simple example in nature, Drs. Balazs and Kuksenok use the single-celled organism euglena mutabilis, which processes energy to expand and contract its shape in order to move. To mimic the euglena’s mobility, Drs. Balazs and Kuksenok looked to polymer gels containing spirobenzopyran (SP) since these materials can be morphed into different shapes with the use of light, and to Belousov-Zhabotinsky (BZ) gels, a material first fabricated in the late 1990s that not only undergoes periodic pulsations, but also can be driven to move in the presence of light. As Drs. Balazs and Kuksenok noted, these systems are distinctive because they not only undergo self-bending or folding, but also self-propelled motion. Namely, the material integrates the powerful attributes of each of the components – the ability of SP-functionalized gels to be “molded” with light and the autonomous mechanical actions of the BZ gels. According to Dr. Balazs, there were unexpected results during their research. “Uniform light exposure won’t work. We had to place the light at the right place in order for the gel to move. And if we change the pattern of the light, the gel displays a tumbling motion. “We also found that if we placed the SP in certain regions of the BZ gel and exposed this material to light, we could create new types of self-folding behavior.” The next phase of the research will be to combine the patterning of the SP and BZ functionality in the gels with the patterning of the light to expand the polymer’s repertoire of motion. Dr. Balazs adds that these SP-BZ gels could enable the creation of small-scale soft robotics for microfluidic devices that can help carry out multi-stage chemical reactions. The benefit of using polymer gels instead of metals and alloys to build a robot is that it greatly reduces its mass, improves its potential range of motion, and allows for a more “graceful” device. Illustration: Time evolution of a rectangular SP-BZ gel in non-uniform light; time increases from (a) to (d). Both ends of the sample are exposed to light; the central circular region is not illuminated. A scientific paper published in 2014 in the New England Journal of Medicine by McGowan Institute for Regenerative Medicine affiliated faculty member Derek Angus, MD, MPH, Distinguished Professor and Mitchell P. Fink Chair, Department of Critical Care Medicine at the University of Pittsburgh, has been selected to receive a Clinical Research Forum Annual Top 10 Clinical Research Achievement Award. “A Randomized Trial of Protocol-Based Care for Early Septic Shock” published May 1, 2014, showed that a structured, standardized approach to diagnose and treat sepsis in its early stages did not change patient survival rates. Project investigators included Dr. Angus and Donald M. Yealy, MD, professor and chair of Pitt’s Department of Emergency Medicine. Watch Dr. Angus explain the study here. 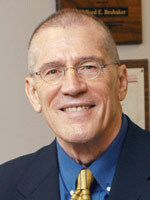 Dr. Angus will be honored along with two other University of Pittsburgh researchers. The awards were announced recently at the Forum’s annual meeting in Washington, DC. The winning papers from Pitt and UPMC were chosen based on their degree of innovation from a pool of more than 50 nominations from 30 research and academic health centers nationwide. The Forum and its supporters believe these and other top ten papers represent the best and brightest work in the field, and will lead to advancements in medicine that will change lives and patient outcomes worldwide. Other awardees include scientists from Harvard Medical School, Yale University, the University of Pennsylvania, UCLA, and other leading institutions. The Clinical Research Forum was formed in 1996 to discuss the unique and complex challenges to clinical research in academic health centers. The mission of the Forum is to provide leadership to the national clinical and translational research enterprise and promote understanding and support for clinical research and its impact on health and health care. The University of Pittsburgh Medical Center (UPMC) Life After Weight Loss program is nationally and internationally recognized for its innovative body contouring surgical techniques following massive weight loss. Headed by McGowan Institute for Regenerative Medicine faculty member J. Peter Rubin, MD, chair of the Department of Plastic Surgery, UPMC Endowed Professor of Plastic Surgery, and Professor of Bioengineering at the University of Pittsburgh, who is one of the nation’s top doctors in the field and the author of a text book on the subject, the UPMC Life After Weight Loss team performs a wide range of body contouring surgeries. Dr. Rubin and his team have pioneered many of the body contouring methods in use around the world today. Recently, Dr. Rubin assisted a NY surgeon at Lenox Hill Hospital on an unprecedented clinical case of excess skin surgery. The patient, 54-year-old Paul Mason, tipped the scale at 980 pounds before gastric bypass surgery 5 years ago. He now weighs 330 pounds, but carries excess skin around his arms, abdomen, and legs, causing infections and impeding his ability to function. He uses a wheelchair, walker, or crutches to get around. The surgery lasted 9 ½ hours, involved about 8 feet of incisions, removing 48 pounds of excess skin from Mr. Mason’s legs and abdomen. His recovery will take 6 weeks, including about 4 days of hospitalization. Another surgery is planned for the future to deal with excess skin from his arms and back. 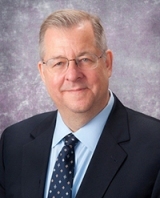 More than 7,000 IBD patients are seen each year by physicians in the Division of Gastroenterology, Hepatology and Nutrition at the University of Pittsburgh and UPMC, which is led by McGowan Institute for Regenerative Medicine affiliated faculty member David Whitcomb, MD, PhD, Giant Eagle Foundation Professor of Cancer Genetics and professor of medicine, Pitt School of Medicine. It was recently announced that researchers at the University of Pittsburgh will collaborate with Janssen Research & Development, LLC (Janssen) on a project to study the effectiveness of potential new therapies for inflammatory bowel disease (IBD). A research team led by Ian McGowan, MD, PhD, professor of medicine, Pitt School of Medicine, will use tissue samples from patients with Crohn’s disease and ulcerative colitis, two types of IBD, as well as from healthy volunteers, to evaluate experimental medicines developed by Janssen. The project was coordinated by the university’s Pharmaceutical Collaborations Committee, which is chaired by D. Lansing Taylor, PhD, director of Pitt’s Drug Discovery Institute. Surgery often is life-saving for many infants born with heart defects, but one thing that doctors cannot do yet is replace heart muscle that is scarred and dysfunctional. McGowan Institute for Regenerative Medicine affiliated faculty member Bernhard Kühn, MD, director of research for the Division of Cardiology at Children’s Hospital, and associate professor of pediatrics at the University of Pittsburgh School of Medicine, and researchers from the Heart Institute at Children’s Hospital and Boston Children’s Hospital hope to overcome the challenge by stimulating regeneration of heart tissue. The findings were described in Science Translational Medicine. Children born with congenital heart disease are at greater risk of developing heart failure even after surgical correction of the problem. For the study, the research team examined the potential of recombinant growth factor neuregulin-1 (rNRG1), which stimulates heart regeneration by driving proliferation of heart muscle cells, called cardiomyocytes. They treated newborn mice with injections of rNRG1 at various times after heart injury and found that early treatment starting the first day after birth boosted cardiomyocyte cell division and heart function, and reduced scarring to a significantly greater degree compared to treatment that began at 5 days after birth. The growth factor also drove cardiomyocyte proliferation in lab tests of heart muscle samples obtained during surgery from human infants with congenital heart disease. More research needs to be done before clinical testing of this strategy, the research team says. 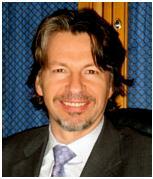 Dr. Kühn began the research while a member of the faculty at Boston Children’s Hospital. 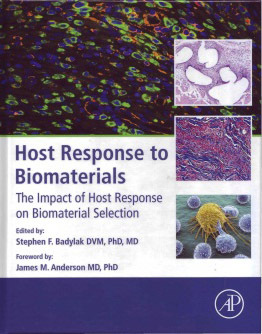 The text addresses the impact of host response on biomaterial selection and includes contributions from leading authorities in regenerative medicine, biomaterials, immunology, and selected surgical disciplines, and promises to be a valuable resource for both research scientists and curriculum developers. Dr. Badylak credits Ms. Allyson Lacovey with administrative assistance that was invaluable in making this publication possible. McGowan Institute for Regenerative Medicine congratulates two of its affiliated faculty members of the University of Pittsburgh Department of Chemical and Petroleum Engineering on their most recent professorships. Ipsita Banerjee, PhD, has been promoted to the position of Associate Professor with tenure. Dr. Banerjee earned her BChE from Jadavpur University in Calcutta, India. She then received her MS from the Indian Institute of Science in Bangalore, India. She achieved her PhD in Chemical and Biochemical Engineering from Rutgers University, from which she won the University and Bevier Fellowship for Excellence in Graduate Research. Steven Little, PhD, has been promoted to tenured Professor of Chemical and Petroleum Engineering effective September 1, 2015. Dr. Little joined the McGowan Institute in 2006 after receiving his PhD from the Massachusetts Institute of Technology. Drs. Banerjee and Little’s continuing contributions to the Department, its students, and its reputation were cited by the Chancellor, the Dean, the Promotion and Tenure committee, and a number of leaders in their fields. Congratulations, Drs. Banerjee and Little! In the magazine’s same issue, learn about 48 hours in the life of Robert Kormos, MD. He and seven other doctors were observed over 2 days and were featured in the story, “Endless Challenges: 48 Remarkable Hours with 8 Pittsburgh Doctors”. Read their stories here. Krzysztof Matyjaszewski, PhD, the J.C. Warner University Professor of Natural Sciences at Carnegie Mellon University, has won the 2015 Dreyfus Prize in the Chemical Sciences. 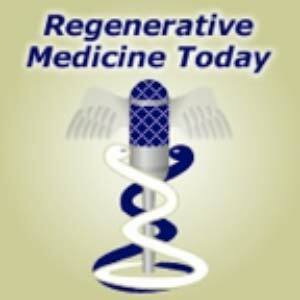 Dr. Matyjaszewski is also a McGowan Institute for Regenerative Medicine affiliated faculty member. The international prize awarded by the Camille and Henry Dreyfus Foundation is given every 2 years to recognize accomplishments in different areas of chemistry. This year’s prize, which consists of $250,000, a medal, and a citation, is being presented for excellence in “Making Molecules and Materials.” Dr. Matyjaszewski will receive the award at a ceremony and lecture held at CMU in the fall. “Krzysztof Matyjaszewski’s work in polymer chemistry follows in the tradition of Camille and Henry Dreyfus, who were major innovators in their day in making polymer materials. We are proud to recognize his immense accomplishments with the Dreyfus Prize,” said Henry C. Walter, president of the Dreyfus Foundation. 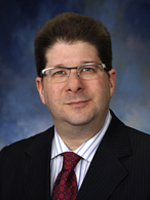 Dr. Matyjaszewski has played a critical role in bringing ATRP to industry for commercial use. Through his ATRP Consortia, he has taught representatives from more than 50 multinational corporations how to incorporate ATRP into the development of new products. As a result, products created using ATRP have a commercial value estimated at more than $20 billion. “I feel very honored and flattered to receive the Dreyfus Prize for making molecules and materials. This recognition addresses not only contributions of my students and collaborators but also all polymer chemists working in the area of macromolecular materials with controlled architecture and functionality for targeted applications,” Dr. Matyjaszewski said. Born in Poland, Dr. Matyjaszewski received his doctorate from the Polish Academy of Sciences in 1976 and completed a postdoctoral fellowship at the University of Florida in 1977. From 1978 until 1984 he was a research associate at the Polish Academy of Sciences. After spending a year at the University of Paris, Dr. Matyjaszewski came to Carnegie Mellon in 1985, and remains an active faculty member. 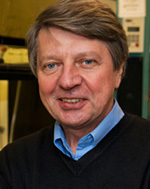 While at Carnegie Mellon, Dr. Matyjaszewski founded the Center for Macromolecular Engineering, served as head of the Department of Chemistry from 1994 to 1998, and was named a University Professor in 2004. The title of University Professor is the highest distinction a faculty member can achieve at Carnegie Mellon. 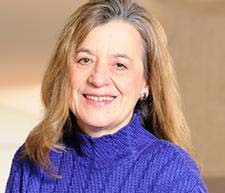 The Royal Society of Chemistry (the United Kingdom’s professional body for chemical scientists) named McGowan Institute for Regenerative Medicine affiliated faculty member Anna Balazs, PhD, its 2015 S F Boys-A Rahman Award Winner. Dr. Balazs was recognized for her development of new theoretical and computational approaches to enable understanding of polymeric materials. The S F Boys – A Rahman Award is for outstanding innovative research in the area of computational chemistry, including both quantum chemistry and molecular simulations. This award is run biennially with the award winner receiving £2000, a medal, and a certificate. Dr. Balazs will also complete a UK lecture tour. Dr. Balazs is the Distinguished Professor of Chemical Engineering and the Robert von der Luft Professor at the University of Pittsburgh. She received her BA in physics from Bryn Mawr College and her PhD in materials science from the Massachusetts Institute of Technology. After postdoctoral work in the Polymer Science Department at the University of Massachusetts, Amherst, she joined the faculty at the University of Pittsburgh. Her research involves developing theoretical and computational models to capture the behavior of polymeric materials, nanocomposites, and multi-component fluids. Dr. Balazs is a Fellow of the American Physical Society, the Royal Society of Chemistry, and the Materials Research Society. She was a Visiting Fellow at Corpus Christi College, Oxford University, in 2000-2001 and 2007-2008. She has served on a number of editorial boards, including: Macromolecules, Langmuir, Accounts of Chemical Research, and Soft Matter. She was Chair of the American Physical Society Division of Polymer Physics in 1999-2000. She received a Special Creativity Award from the National Science Foundation. In 2003, she received the Maurice Huggins Memorial Award of the Gordon Research Conference for outstanding contributions to Polymer Science. Recently, she received the American Chemical Society Langmuir Lecture Award (2014) and the Mines Medal from the South Dakota School of Mines (2013). From the laboratory of McGowan Institute for Regenerative Medicine affiliated faculty member James H-C. Wang, PhD, director of the MechanoBiology Laboratory within the Department of Orthopaedic Surgery and professor in the Departments of Physical Medicine and Rehabilitation, Bioengineering, and Mechanical Engineering and Materials Science, Dhanalakshmi Thiyagarajan was one of two students to receive the 2015 Omicron Delta Kappa Senior of the Year award, which is given to students who possess and exhibit outstanding leadership qualities in service to the University. Ms. Thiyagarajan’s name will be engraved in a walkway between the Cathedral of Learning and Heinz Memorial Chapel alongside the names of previous recipients of the award. Dhanalakshmi Thiyagaraja from Bethlehem, PA, graduated with a bachelor’s degree in bioengineering from the Swanson School and a minor in chemistry from the Dietrich School. She also earned a Certificate in Conceptual Foundations of Medicine from the Department of History and Philosophy of Science. She has been accepted into Temple University’s School of Medicine and will begin her medical studies in the fall. Ms. Thiyagarajan is the founder and president of the Gluten Free Awareness League on campus, and she has been promoting gluten-free awareness in the United States and India, working with national organizations, companies, and restaurants. For her efforts, she was profiled in the Fall 2013 edition of Allergic Living magazine. Ms. Thiyagarajan has also demonstrated leadership on campus as president of the Society of Women Engineers chapter at Pitt, after serving the organization since 2011 as historian, membership chair, and secretary. She has served as an ambassador of the University Honors College, vice president of the Outside the Classroom Honorary Society, member of the Biomedical Engineering Society and of CHAARG (Changing Health, Attitudes, and Actions to Recreate Girls), and a tutor for students enrolled in courses based in science, technology, engineering, and math. In 2014, Ms. Thiyagarajan won the Swanson School’s Sustainability Design Expo for Product Realization for a new dental implant mesh she developed. She also was selected by Pitt’s Innovation Institute to represent the University in the national “1000 Pitches” competition in the health category for her idea of a gluten-free sleeve to prevent cross-contamination of foods. Ms. Thiyagarajan also won the Swanson School’s 2015 George Washington Prize, was named the outstanding sophomore student leader through Blue Stars Red Carpet in April 2013, and won the president’s award through Blue Stars Red Carpet in April 2014. #147 – Dr. Faina Linkov is an Associate Professor, University of Pittsburgh School of Medicine, Department of Obstetrics, Gynecology & Reproductive Sciences, Magee-Womens Research Institute. Dr. Linkov discusses her research in gynecologic malignancies. Backscattered SEM micrograph of branching odontoblast processes at the dentino-enamel junction in a mouse molar tooth. 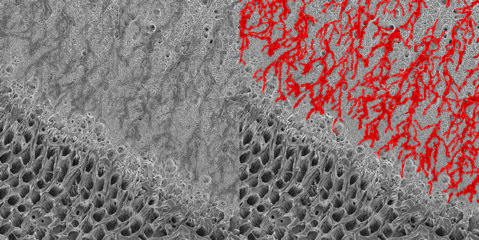 The processes are artificially colored in red in the right image (Courtesy of Xu Yang and Elia Beniash, Dept of Oral Biology, University of Pittsburgh School of Dental Medicine).